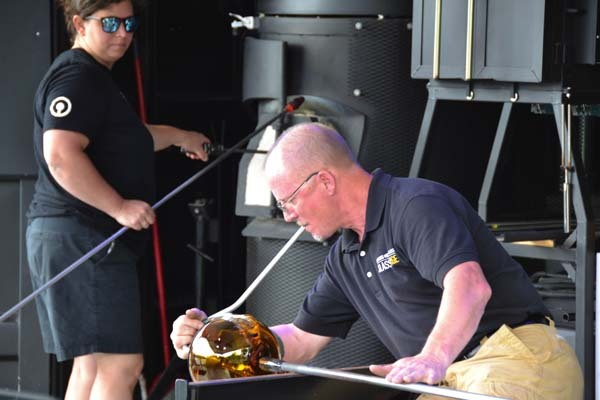 AMSTERDAM — Dozens of spectators made their way to Riverlink Park and onto the ‘GlassBarge” on June 27, despite the rain, to witness live glass blowing demonstrations, which took place for free every hour on the hour from 11 a.m. to 6 p.m. In commemoration of both the Erie Canal bicentennial and the 150th anniversary of the Brooklyn Flint Glass Company — now Corning Incorporated — members of the Corning Museum of Glass are making their way from Brooklyn to Conring, New York t upon a 30 by 80 foot river barge, donned the “GlassBarge.” They are making stops at various spots along the waterways to “share the story of glassmaking in Corning, [and to emphasize] the continued role of New York’s waterways in shaping the state’s industry, culture, and community,” according to a press release. 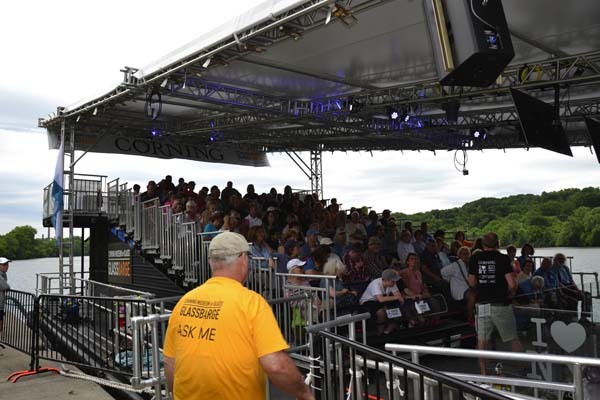 “We’re basically at capacity for every show we put on and if we add that all up we’ll probably see 80,000 people this summer on the barge,” said Rob Cassetti, Sr. Director of Creative Strategy and Audience Engagement for the Corning Museum of Glass. The GlassBarge is fitted with a mobile hot glass blowing unit and bleacher seating for spectators. With a revolving group of glassblowers on board the GlassBarge, roughly eight pieces of glass are made each day. Once made, most all of those pieces are donated to various people and supporters along the way. 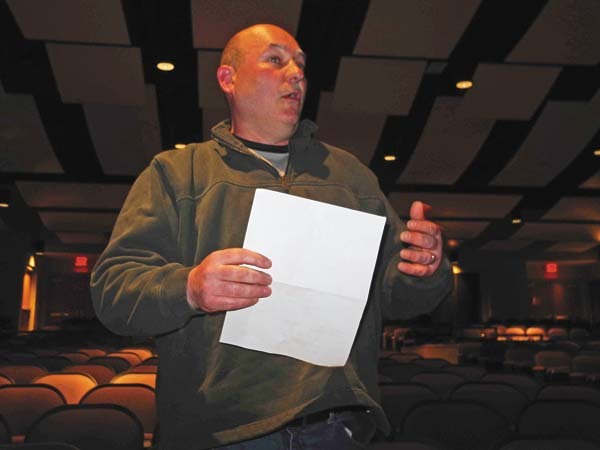 “At every stop we have so many people that have helped us out. 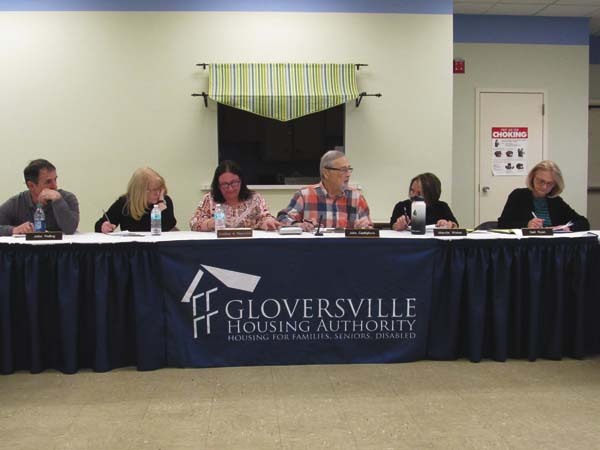 And then we have sponsors that are helping support the project so we find those right opportunities to spread a little bit of love,” Cassetti said. 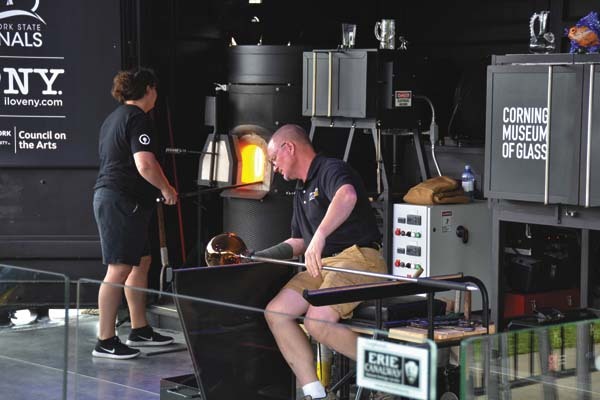 While most of the pieces made on the barge are donated, those interested in bringing home their own piece of custom glasswork need only visit the Corning Museum of Glass, which has on display work from all of the featured artists. Corning Glass Works, founded in 1851, moved to Corning in 1868. Over the ensuing 150 years, the company has been crucial in the development of numerous glass-based technologies, including telescope lenses, automobile glass and headlamps, fiber optics, and special glass used for cell phone screens. The Corning Museum of Glass was established in 1951 to share the history, science, and art behind glass. 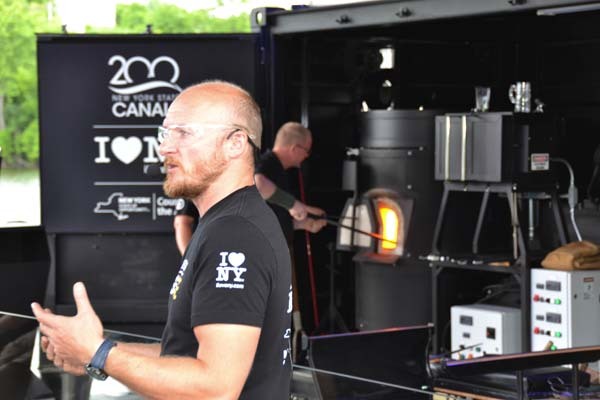 For years the Corning Museum of Glass has specialized in mobile glassblowing demonstrations, but the GlassBarge was developed specifically for this summer’s tour. 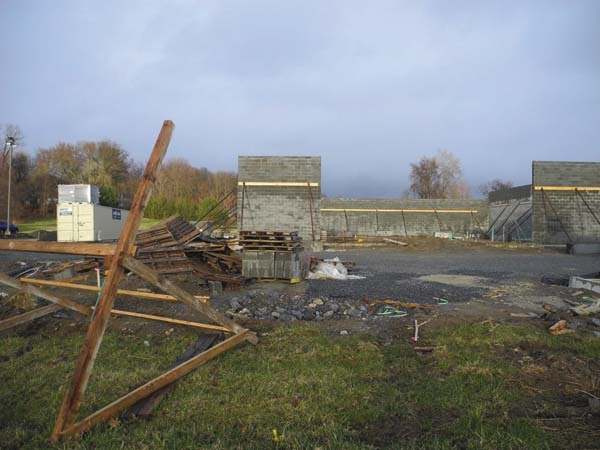 “This is actually our first Erie Canal stop on the tour,” said Cassetti. Accompanying the GlassBarge on its trip is the Lake Champlain Maritime Museum’s Lois McClure, a 19th century replica canal barge captained by Erick Tichonuk, along with historian and co-leader Art Cohn, who wrote a book detailing the historical research that went into the boats recreation. Rob Cassetti of Corning Museum of Glass detailed and emphasized the significance of the relationship between Corning Glass Works and the Erie Canal. 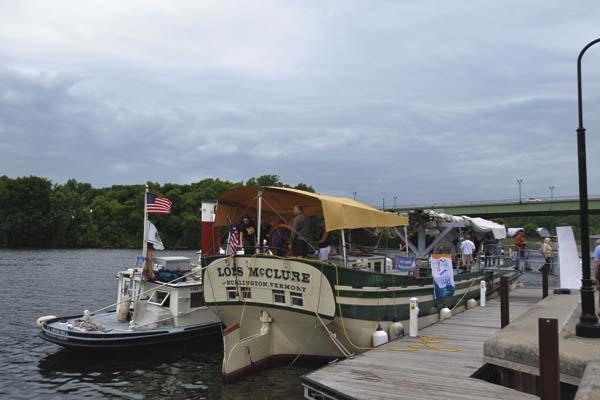 Both the GlassBarge and the Lois McClure will be in Sylvan Beach this weekend as they continue their journey back to Corning.